Today marks the last session of the month with Art Not Love records. Their radio residency highlights include an interview with costume designer/film-maker Jenn Wade, a performance by Ari Swan and engaging conversations with Peggy Hogan and Charlie Twitch. Here’s what’s scheduled for their grand finale! 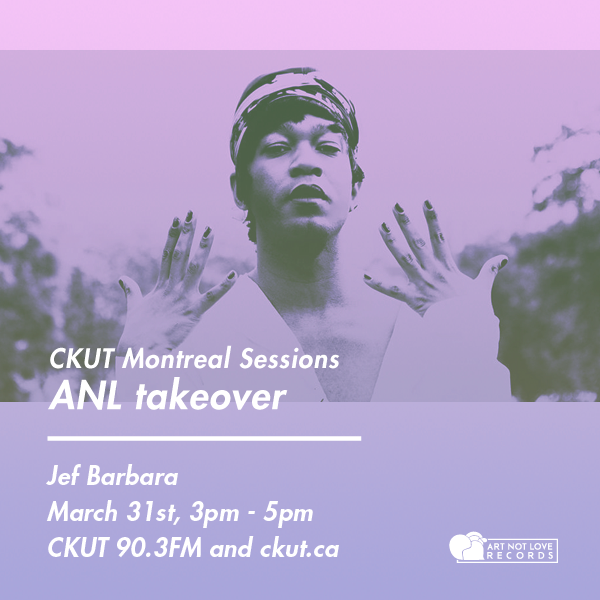 This entry was posted in CKUT programming and tagged art not love, Jef Barbara, The Montreal Sessions on March 31, 2015 by Nick Schofield. For their fourth instalment, Art Not Love is spending today’s episode speaking with their artists and friends, exploring deeper dimensions of what goes into their practice and approach. In the first hour, tune in for an interview and performance with L.A. Foster, a powerful yet soulful local force, one you may recognize from CKUT’s Venus collective. For the latter half of the program, Toronto-based Dirty Organs is in the 514 to unveil a live set over the radio waves. Be sure to check out what Art Not Love is keeping busy with when not revelling in radio. 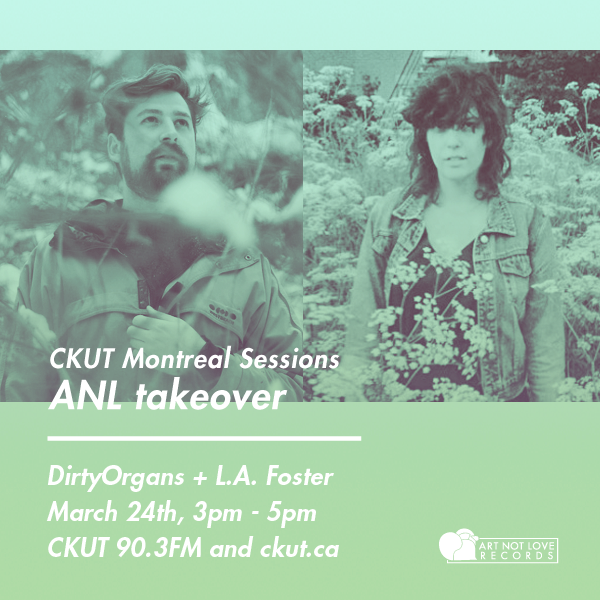 This entry was posted in CKUT programming and tagged art not love, Dirty Organs, L.A. Foster, The Montreal Sessions on March 24, 2015 by Nick Schofield. 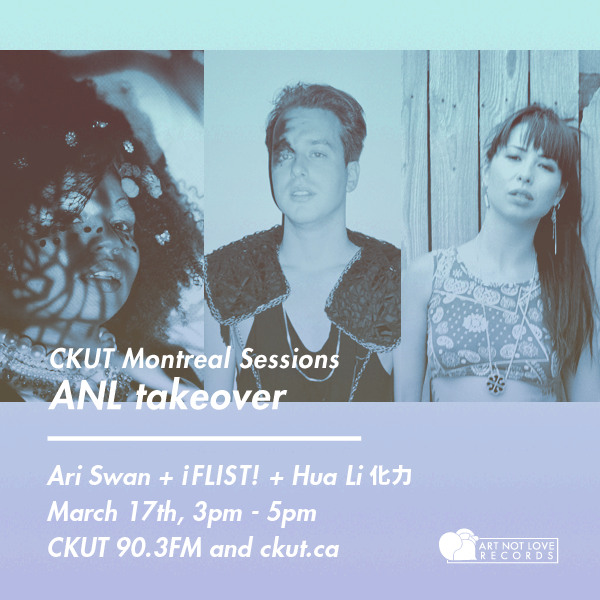 This entry was posted in CKUT programming and tagged ari swan, art not love, charlie twitch, hua li, The Montreal Sessions on March 17, 2015 by Nick Schofield. This entry was posted in CKUT programming and tagged art not love, charlie twitch, jenn wade, nick schofield, Saxsyndrum, The Montreal Sessions on March 10, 2015 by librarian. 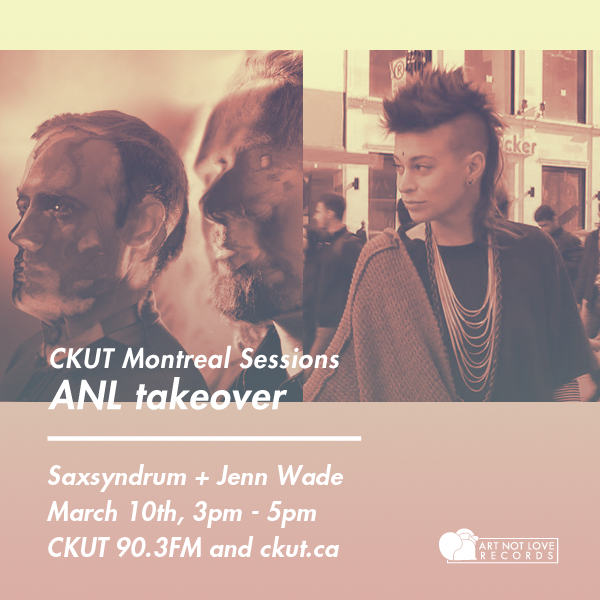 It’s time to welcome our March curators of The Montreal Sessions to the airwaves. Say hello to Art Not Love, Montreal’s relatively new non-genre-normative label, headed by artistic savants Charlie Twitch and Peggy Hogan. This month they’ll be introducing listeners to their roster and what inspires their masochistic practices. Today, Rushing Silver will be on the phone for an interview about her music and Robby Reis, a prolific photographer, will be in studio to chat about his focus. Come for the art, stay for the love. 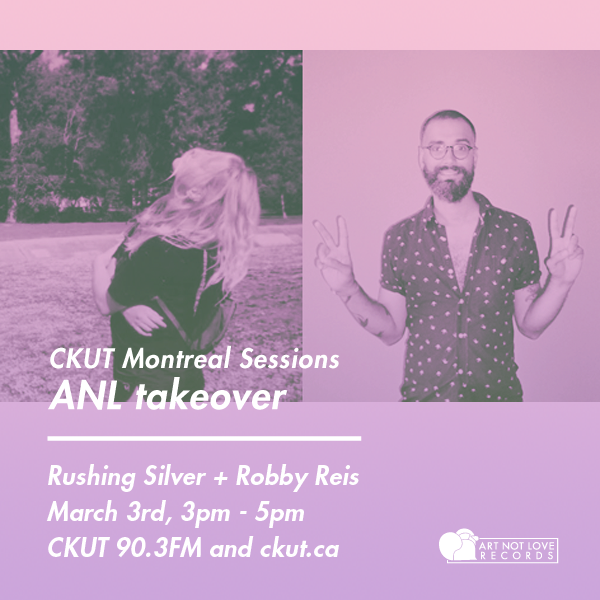 This entry was posted in CKUT programming and tagged art not love, FLIST!, hua li, robby reis, rushing silver, The Montreal Sessions on March 3, 2015 by Nick Schofield.